As I said yesterday the quick watercolor sketches I do are sort of like thinking out loud visually. I knew that yesterday's watercolor had many things that I would change if I did a more developed watercolor. So today I began a more developed watercolor. I'm still experimenting with techniques though so this msy turn into just another preliminary watercolor. Today I laid down some broad washes before starting as an experiment. These may unify the painting coloristically but they also take away white areas, for good! So I ended up going back into this with white gouache. And I still need to use more, especially on the foreground goose. I do like the lighter color it has so far. Of course I really haven't touched the geese or turtles yet. What I do there may make or break the painting. I held off on this time because I knew how complicated the background would be and wanted to work on it first. This is another new method for me. Only time will tell whether I decide that it's a wise one. Tuesday afternoon - The newest version is now at top. It's nearly done. I do need to knock down a couple of the white highlights a bit. But other than that I think I've done all I can do with this. It has been fun experimenting with composition. I'm not sure how I feel about how the color and values worked out. That will take awhile to see. As usual in this type of painting I don't go for great detail in the birds. I want them to be recognizable but don't want them to look like highly detailed cutouts pasted on top of a generalized background. 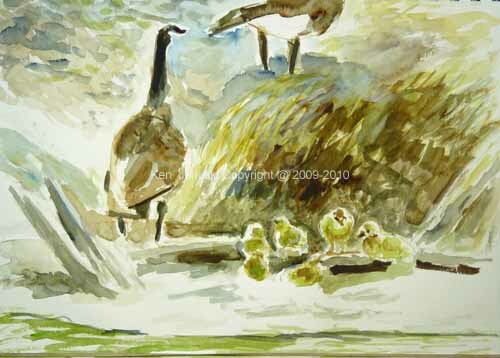 I know that Canada Geese are not the favorite bird of most people, and I understand why. But we've been seeing a lot of them recently, most on nest but one with goslings. It's odd that we've never run into so many on nest before. I don't know if we just didn't happen to be at these areas at the same time of year, were just oblivious to them or what. Especially at Morris Arboretum wetlands we keep running into pairs of them, with one on nest, as we walk around the pond. Seeing them and their breeding behavior up close has given me a new appreciation for them. 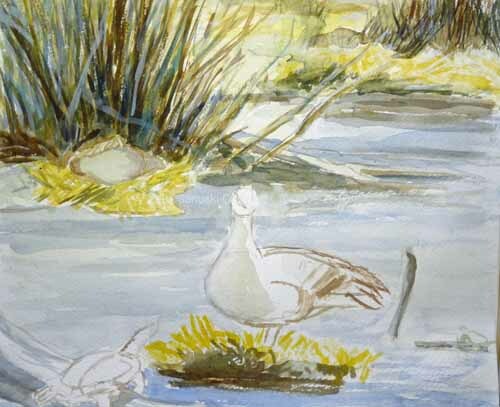 Yesterday at the suggestion of some artists at birdforum, particularly Sid Frissell and Nick Derry, I did a quick painting based on two of my sketches from earlier this week at Morris: one a Canada Goose on nest, the other a turtle sunning himself on a log. 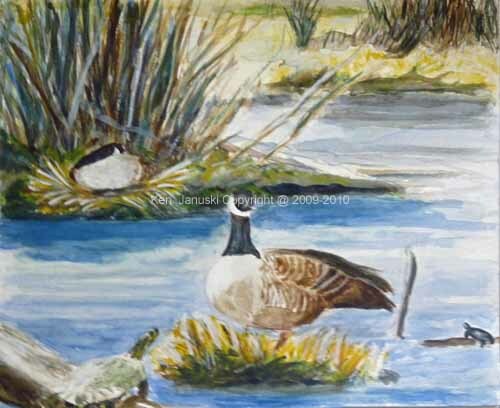 I then added a third Canada Goose from a photo I'd taken there a few weeks ago. This is a small, quick watercolor, more of a study than anything else. I could have tried some preliminary sketches first but I wanted to just try it out in paint. Now that it's done I can see that if I were to do a finished painting I'd change the composition a bit. 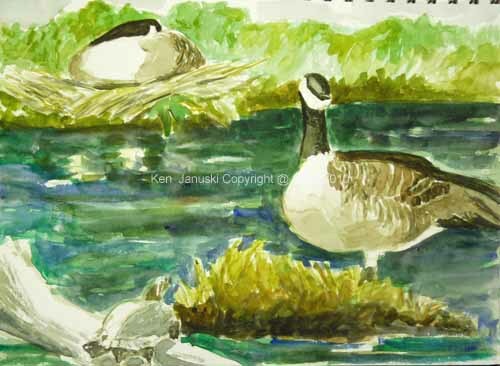 I'd probably not let the water get so dark, and I'd put a little more color in the turtle and have the browns of foreground hummock not so closely match the browns of the foreground Canada Goose. That's the nice thing about such quick paintings. They allow you to think out loud. With a more flexible medium, like oil, I could just make the changes on the same painting. But watercolor turns to mud when overworked. So most of the time the changes that need to be made have to be made in a new painting. And that's fine. I think this tends to make me more carefree and adventurous in these paintings. It's not often that Picture Perfect Days come along and I'm not noticing them on my way into work. But today was one. I had the day to myself and spent four hours at Morris Arboretum drawing birds as seen through my scope. The only unusual bird today was a Blue-gray Gnatcatcher and he was gone too quickly to sketch. 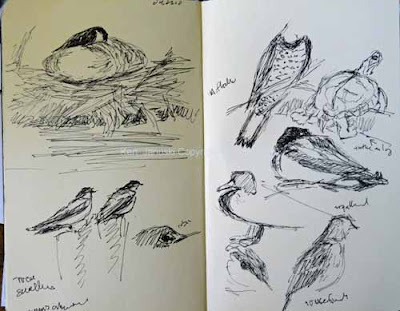 But sometimes it can be a pleasure to just really look at, and sketch, very common birds like American Robins, Canada Geese, Mallards, and Tree Swallows. Also shown here are a headless Northern Flicker, a House Finch with a mangled head and an unidentified turtle. With a scope, and birds that sit still for a bit, there's a world to see and portray. I used pen and ink here, a Faber Castell Pitt Artist Pen. Sometimes I find that I'm less tentative if I use something permanent like ink. No need to worry about mistakes and erasing. I just have to live with what I put down. It always surprises me how much fun it is to work this way. 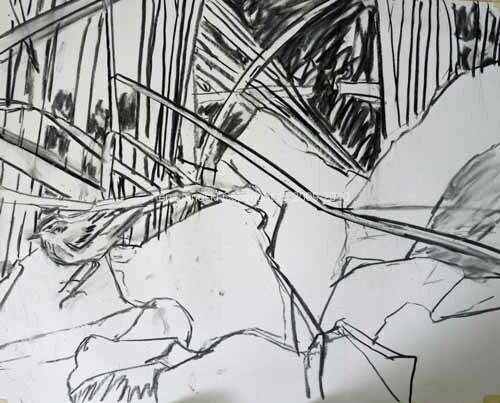 I hope to continue a full schedule of field sketching. Hopefully by the peak of migration I'll finally be able to capture some of those splendid migrants, especially the wood warblers, live! Spring has finally arrived here, though not yet with a vengeance, at least as far as migrants and returning breeders go. I've seen a few warblers, both Yellow-rumps and Palms, and I've seen one Eastern Phoebe and heard three or four. Eastern Towhees are conspicuous and there are many dueling birds, for mates and territory I'd guess. But still I just haven't see all that many birds yet. I'm well aware of this because I've been out for 3-4 hours each of the last three days, birding and sketching. I'm determined that this is the year when I'll become an accomplished field sketcher. As you can see I have a very, long way to go! But you have to start somewhere and one place is to reach for the sketchbook rather than the camera. That's what I've done the last few days. 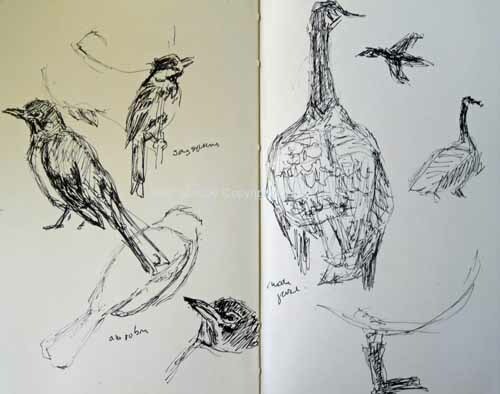 First the sketchbook, then maybe the camera, if I want to remember something like the wing bars of a Ruby-crowned Kinglet or the facial markings of a Blue Jay. Part of the pleasure of field sketching I think is similar to swimming. It's easy to say: I can't do it; that's impossible; or something similar. But once you take the plunge you find out it's not so bad and it can become addictive. One moment that expresses that today was a scene of a Red-bellied Woodpecker hanging upside down on a limb a few feet away from a right-side-up Robin. I've sketched that in just a few quick lines here. I don't think I could ever get that with a photo. And though it doesn't look like much it still could become the seed of a painting. The ability to draw this type of actual encounter in nature is part of the reason it can become addictive I think. I was out for 6 hours today, in two different locations. I ended up at a blind with feeders in front of it at Schuylkill Center for Environmental Education. 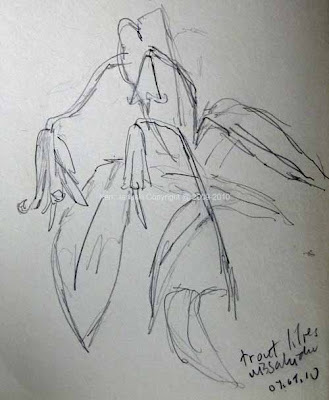 I have to confess by that time I did only a few sketches, e.g. the Blue Jay here, and then resorted to a camera to end the day. Eventually I hope to do a more finished drawing of the female Red-winged Blackbird which I've sketched here. But I also have some photos for details. 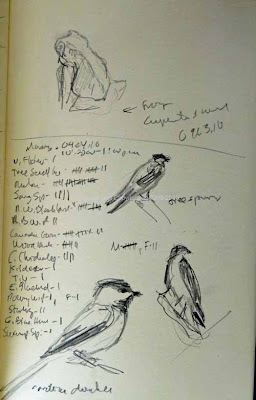 Other birds sketched include: Carolina Chickadee, Yellow-rumped Warbler, American Robin, Eastern Towhee, White-breasted Nuthatch, Ruby-crowned Kinglet, Northern Cardinal, Cowbird as well as a groundhog and a Jack-in-the-Pulpit. We spent about 3 hours at Morris Arboretum wetlands again today, hoping to see some migrants. Though it was supposed to only get to 59 at least it was supposed to be sunny. The sun should make it seem much warmer. Well it might have if the clouds hadn't been so thick. But as it was it stayed both cloudy and cool. Many Canada Geese were on nest and then as we came on what must have been about the fifth couple they let out particularly loud squawks. Then I saw why. They had 6-7 goslings. What was most amazing is that they seemed to be tinged in a light lime green. I did a quick watercolor of them at top from some photos I took. And finally we saw our first warblers, palms. The first was far way and not very satisfying but the second landed in front of us full of his golden wash. They are always such a pleasure to see in spring. 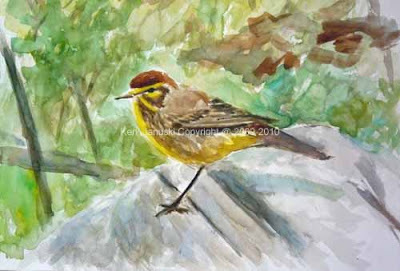 In celebration of the first warbler of 2010 I did this quick watercolor and gouache based on an old photo. I'm not happy with it but I'm just showing it as an illustration not a work of art. Too busy to write much else today. But I did want to post these two watercolors of birds that we saw. I always fear, though not too much, that I lose readers when I veer off into art theory. I do like art theory, in fact I have a fondness for theory about all sorts of subjects, but sometimes it just seems like mumbo-jumbo. I see eyes glaze over as I rattle on. So I keep my distance from it most of the time. Sometimes it just seems too indulgent and abstract. So............back to something more straightforward. Last Sunday Jerene and I spent 4 1/2 hours walking the trails of the nearby Schuylkill Center for Environmental Education. Our hope was to find our first Palm Warbler of the season but we knew that we might not. 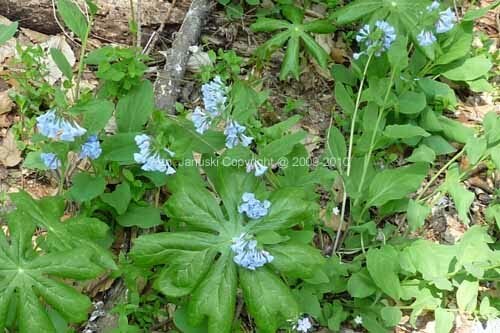 We did expect to find plenty of other birds, and certainly wildflowers. At top is a sketch I did of some fading Trout Lilies on Forbidden Drive at the Wissahickon last Friday. Immediately above is a photo of one seen at SCEE on Sunday. There were thousands and thousands of them, though not really very many in bloom. I assume that many are too young to flower. But the ones that were in flower seemed to be just starting rather than just ending as at the Wissahickon. Not to immediately go back to theory but here's a question: which do you prefer, the sketch or the photo? Photos really can show you detail that you could never get down in a drawing. And yet I always prefer sketches. I'll get back to some other wildflowers that we saw but first I'd like to mention the title: Mystrees and such. The reason is below. What in the world is this? The light maroon flowers were on a multistemmed tree that rose 20-25 feet in the air? 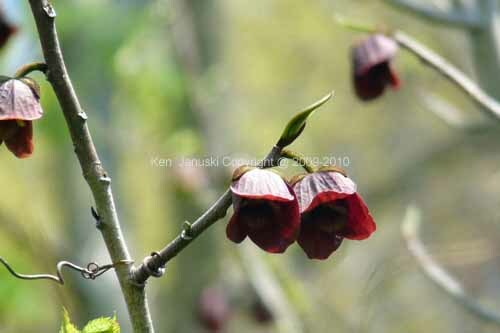 They remind me of flowers from the hibiscus family, but I don't know of a tree in that family. And I really haven't had much time to look. I took a quick look through David Sibley's Guide To Trees, but didn't find anything on my quick perusal. However it's not organized by key as some guides are. So you really can't look for maroon flowers. We have a guide that does use such keys but I just haven't had time to look at it. Maybe tomorrow. Until then I leave it to readers. OK, you readers were slow on the draw here. Once I finished all the paperwork I had due today, both tax and otherwise I took out my 'The Tree Identification Book' by George W.D. Symonds. Sure enough I went to flowers and found it. Since the book is not in color I then searched the web to make sure. These are the flowers of the Pawpaw. I highly recommend this book and well as his book on shrubs. An additional note. According to wikipedia the Pawpaw has the largest edible fruit indigenous to the North American Continent. The trillium above was almost the exact same color as the mystery tree. And it too is a mystery. 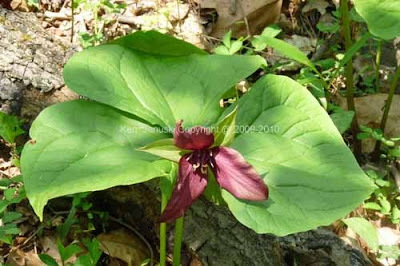 There's no doubt it's a trillium, but which of the various red trilliums? I might have time to investigate tomorrow. But for now it's another one for readers to identify. We never did find our Palm Warbler. In fact we still haven't seen our first warbler of 2010. 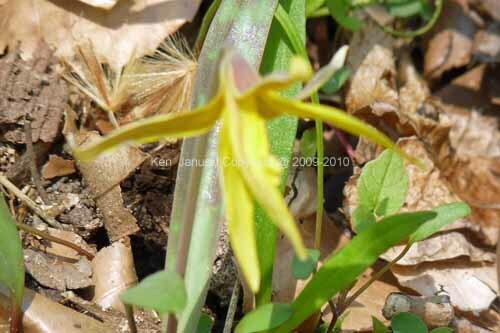 But we did see our first Osprey, Brown Thrasher and Hermit Thrush of 2010. They all reminded us that the orderly procession of the natural calendar marches on. Its regularity is a comfort in an often chaotic world. I seem to always see Palm Warblers down among the full Mayapples. I didn't take any photos of the Mayapples. But I did take one of these Bluebells. We often see Palm Warblers near them at SCEE. 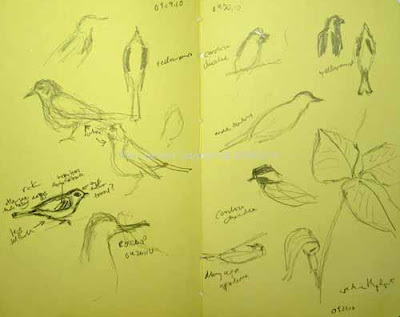 Hopefully one of the next sketches I show will be based on Palm Warblers and bluebells. I just need those Palms to finally show up! And sad to say I see I'm up to white lies again: some Mayapples snuck into the Bluebells photo! I confess that this is a somewhat self-serving post. 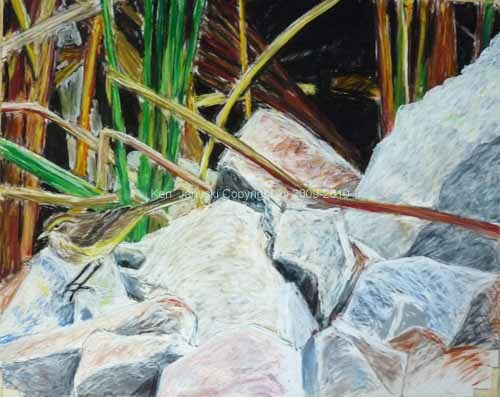 I'm putting up this version of the Palm Warbler drawing so that I can see it online. I could also do so by just looking at it on the computer. But I prefer to put it on the blog, along with some explanation. Some artists look at their painting in a mirror. I used to sneak up on mine. I'd go away and come back in the room and see how it hit me just as I peaked in the door. You might think this seems silly or unbelievable. But I think it's safe to say many artists don't really know what they're doing. They have to do it, sneak up on it, and then see if it gives them a clue as to how to proceed. Authors talk about their characters taking over the plot and determining where it will go. The same is true in art. So putting this online may give me a clue as to what to do next. I have always been struck by the brilliant white of the limestone on Dike Road at Horicon Marsh, especially in conjunction with the background reeds. The new reeds are green and maroon with bits of yellow and orange. The old dead reeds are a pale ochre. But then as you look back into them you see the richest dark. It would make Velazquez, Goya and Manet jealous. Add to this scene one elegant Palm Warbler and you can see, I hope, why I chose to draw it. 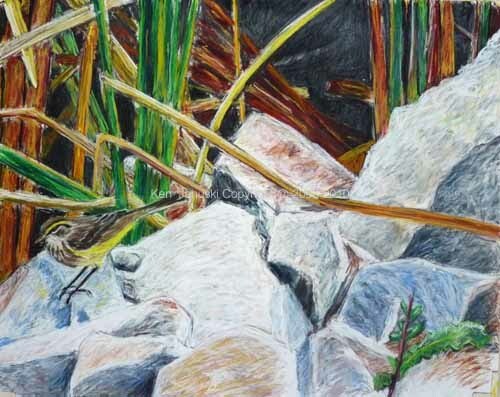 But there are extreme color contrasts: the cool white of the rocks, the deep rich reds, oranges, greens and black of the reeds. And then the sublty colored dun-browns of the warbler. How you put them all together in one painting? Well that was the challenge here and I haven't solved it. I thought adding some color to the limestone might help. But if it has it's surely not enough to do the trick. Past experience tells me the answer will be simplification. It often is in art. You go back and forth, round and round, and finally you simplify. We shall see. Monday morning - added the newest version at top. Still deciding on whether it needs more work. Wednesday afternoon. Yep it is done! I didn't really see the need for a separate post for this. But in case you were waiting, on pins and needles, to see if I was going to change it the answer is no. This is a more ambitious drawing than many of mine. But it may seem like a less successful drawing. The warbler is secondary at best. But that is fine with me. Birds exist in a world, not in isolation. I'm not a big fan of bird portraits. I prefer them in their environment. And though I've never been a great fan of Robert Bateman I am impressed by his desire to show the environment in which his subjects live. (And of course I'm impressed by his devotion to saving the environment from the many thousands of people who are all to happy to destroy it and everything in it.To me birds aren't trophies to be put up on pedestals. They're real creatures in a real world. And this is a real scene, the only modification being the addition of the wild lettuce. It did show up in other photos I took of same scene so it was nearby. My guess it that this may not be my most popular art. But I do think it is one of my best works of the last year. Stravinsky's 'Rite of Spring' is on the radio right now. Today it's hard to understand the uproar it supposedly caused when first played in 1913, almost 100 years ago. But I, and many others love it. It is a rite of spring now. You hear it and you think of spring. Such is the power of art. I thought briefly of the power of art while watching Charlie Rose interview the author, directors and actors involved in a new play called 'Red' about Rothko. Rothko, who I never really studied deeply nor appreciated strongly, was one of those people who seemed to think that 'power of art' was an understatement.To me he and others of that time almost seemed to put on it the burden of religion. It should solve all human problems. It's a noble goal but I've often wondered if that's not too burdensome. Perhaps it's like the children of famous parents. Often it seems that the burden of matching or exceeding the parents accomplishments freezes the children into inaction. Perhaps the emotionless Pop Art that followed was an inevitable reaction. Who knows? In any case it's something I often think about. I come from an artistic traditions of 'powerful' art. If it's not powerful, almost religious, it's not worth doing. I'm sure much of this came from my teachers and just the zeitgiest of the time. It was pre-irony, pre-Warhol, when art had to mean something. The reason I think of this is that I'm now doing small paintings and drawings of birds. How powerful is that? Well on the surface not very. And to a large extent I don't think that's the motivation of most wildlfe and/or bird artists. And yet I think that there is a real primal drive for many. That drive is based on a love of nature, and a trust in their own honest response to nature. They're not cowed into thinking that they need to take an ironical stance toward it. So bird art itself can be powerful in that it is acknowledging something that has been very important to most cultures throughout history: nature. This is powerful in its own way. But enough on that. I don't have any answers. And I'm not trying to write an apologia. But the juxtaposition of 'Rite of Spring', 'Red', and my own recent work made me want to digress a moment in that direction. Above are the first two stages of a pastel and charcoal drawing showing a Palm Warbler on the limestone rocks at Horicaon Marsh. This is the western race, which is much paler and duller than the golden washed warblers we see here. In fact I'm nos going out in search of some. They really are golden wonders - an integral part of the real rite of spring. A White Lie - Just as I was about to post this the radio announced the end of 'Petrouchka' by Stravinsky! Petrouchka not Rite of Spring. I used to play them so much at the same time of my life that I got them confused. Still I think what I said remains true. Both 'Petrouchka' and 'Rite of Spring' show the true power of art. OK. Done with the lies. Time to go find a Palm Warbler. Four hours later and I've returned from an unsuccessful hunt for the first of year Palm Warbler. Maybe tomorrow. However I found my first Northern Rough-winged Swallows of the year, chittering away in exhuberant flight. They were a pleasure to see and hear. I also added more color to the drawing and finally developed the warbler a bit. All that's left is to unite the light and dark areas into a vibrant whole, all the while not making the warbler disappear. Where Are You, Little Bud? Well it was nice to see the Bald Eagle last week while out looking for our first Eastern Phoebe of 2010 but eight days later and we still haven't seen a Phoebe. Jerene thought she heard one yesterday at Carpenter's Woods but I didn't hear it and neither of us saw it. Today we spent the late morning at Morris Arboretum, for one of the most beautiful Easters in years, but neither saw nor heard any Eastern Phoebes. Where are they? I'm sure we'll see one soon, I guess when we've given up on them and are looking for wood warblers instead! 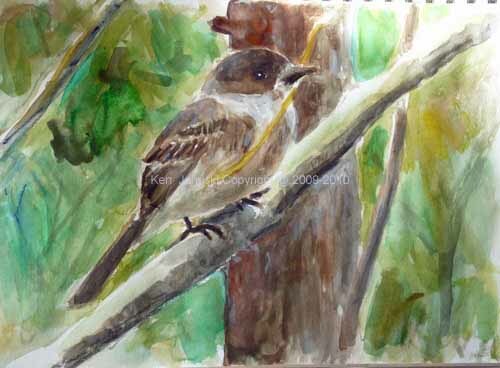 The quick watercolor above, one I'm not really thrilled with, is based on a photo of a Phoebe seen in Illinois a few years ago as it gathered material for its nest. Both yesterday and today some frogs, I believe North American Wood Frogs, were both loud and indecent. Though I did take a few photos I decided to keep this blog family-friendly and not do any drawings of frog orgies. I guess it's that time of year. 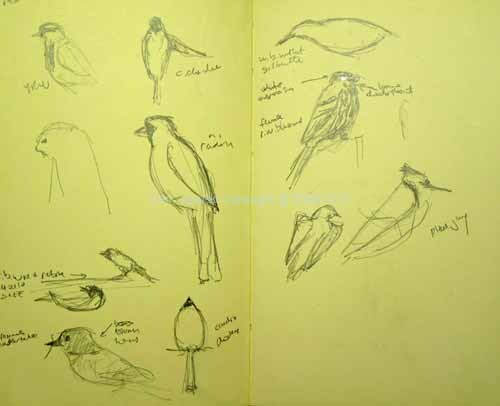 Included above are a couple of quick field sketches of one frog, a Carolina Chickadee and a Tree Sparrow. I'm not really happy with them either but they're the start of the season. They should get better with time. AND, they're a learning experience. As usual the birds did not sit still. So I tried to get a mental image and then get it down on paper. Only when I got home and looked at some photos I took did I realize that the eye of the Carolina Chickadee is within the black cap, not below it in the white part of the face. I modified my sketch to show this. But the important thing is that I'd never even thought of the location of a Chickadee's eye before. 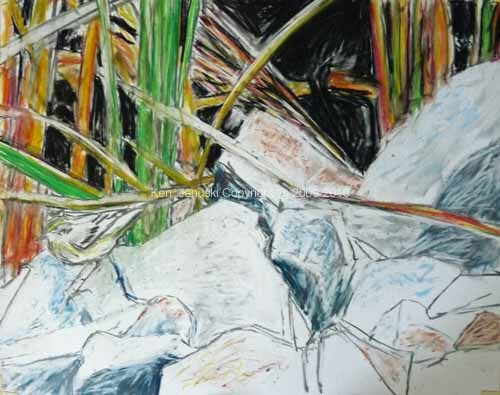 That's why I say that field sketching more than anything else shows you what you don't know. But that is incredibly valuable. You only learn when you realize your ignorance. I suppose this could sound depressing. But I'd rather know what I don't know so I can learn more than go around blithefully ignorant.